Reference number for this case: 54-Troussey. Thank you for including this reference number in any correspondence with me regarding this case. The panic began to spread. In the village of Troussey, sugar beets gatherer Alexandre Ronnejki, who needed a haircut, was attacked by a crowd who thought he was a hairy saucerian. People's nerves still on edge. A mob in the French village of Troussey attacked a suspious figure believing it a Martian. The figure turned out to be a farm laborer by the name of Alexandre Ronnejki who made the mistake of not not getting a haircut for some time. The fate of the poor fellow was not mentioned in press accounts, but in another case we know there was an injury (See newsstory). 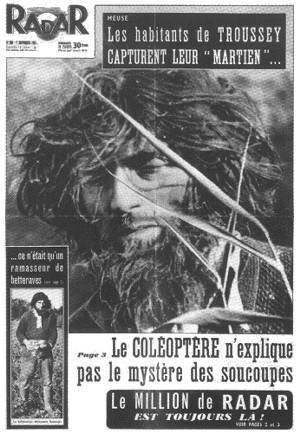 In Troussey (Meuse), the courageous inhabitants helped by the constabulary captured and tied a "Martian" who was merely one Polish hirsute beet picker who made a camp fire in the countryside. The "million de radar" was a contest organized by this magazine, who promised a milion of old francs (aka centimes of modern francs, 7 modern francs being 1 of today's euro) to whoever would deliver a martian to the magazine. [ra1] Article in the national magazine Radar, France, #300, November 7, 1954. [gb1] "Troubled European Skies, article by Gray Barker, in his flying saucers magazine The Saucerian, Gray Barker editor, USA, Vol. 3, No 2, page 23, Spring 1955. [lg1] "The Fifth Horseman of the Apocalypse - UFOs: A History - 1954 November - December", monography by Loren E. Gross, page 10, 1991. [dc1] "Les amis des visiteurs de l'espace", web page by Dominique Caudron, France, circa 2005, at perso.wanadoo.fr/oncle.dom/paranormal/ovni/cas/ummo/amis/amis.htm, 2004. 1.1 Patrick Gross December 8, 2016 Additions [gb1], [ub1].